When it comes to my writing, especially as it pertains to my personal life, even though there are a lot of people reading this that know me, or at the very least live in Pittsburgh, I have to write as though you’re all a bunch of strangers from anywhere on the globe (surprisingly, some are). For everyone that actually does know me or knows about a local events that help set the scenes of my stories, bare with me. I’ll try to be as entertaining as I can until the new content begins… but at this point, would any of you be shocked that my life has turned into a Nintendo game? When a new responsibility enters your life, especially one that’s a complex living being depending on you, your life takes on fairly massive changes. This is my furry roommate, Kylo. He has his own Instagram. Feel free to give him a follow. Kylo has changed damn near every routine I ever had. That’s not a bad thing, but there are some things that I do now that I would have never even considered doing before, and I do so solely for Kylo’s well-being. That’s what taking on this new responsibility dictates. That’s what is demanded of me. One of those things is waking up early and taking him for a walk first thing in the morning. I am not, repeat NOT, a morning person. To me, mornings are nothing but a fog waiting to clear. The ability for me to start thinking critically is not something you should rely on me to be capable of for a fair amount of time. The way I function, there is no snooze button. By figuring out the exact time it takes me to get my morning routine done, a routine that I have previously figured out the most efficient way to execute, I know the exact time I need to wake up so that I walk into my office right on time. Not a second early. Not a minute late. From the moment I wake up until the second I sit down in my car to leave for work, everything happens at the same time everyday. 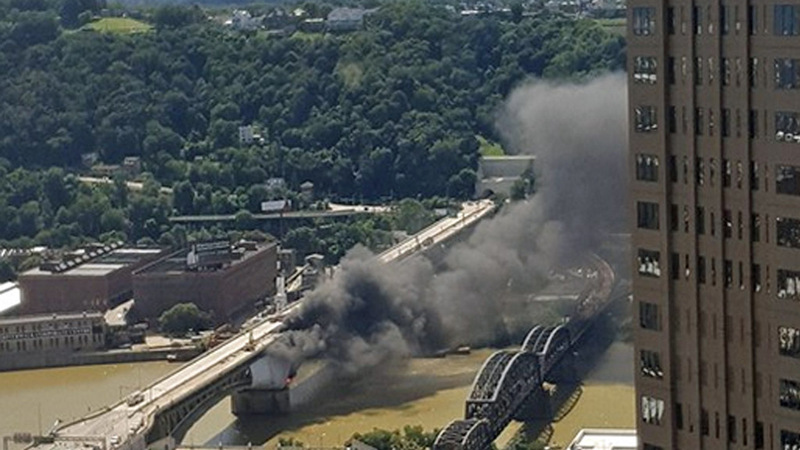 About 5 months ago, the city of Pittsburgh decided to hire a genius for a contractor to work on the Liberty Bridge construction. Despite knowing the job would entail an exorbitant amount of welding, thus spewing streams of hot sparks around for extended periods of time, the contractor opted not to use flame-retardant tarps. 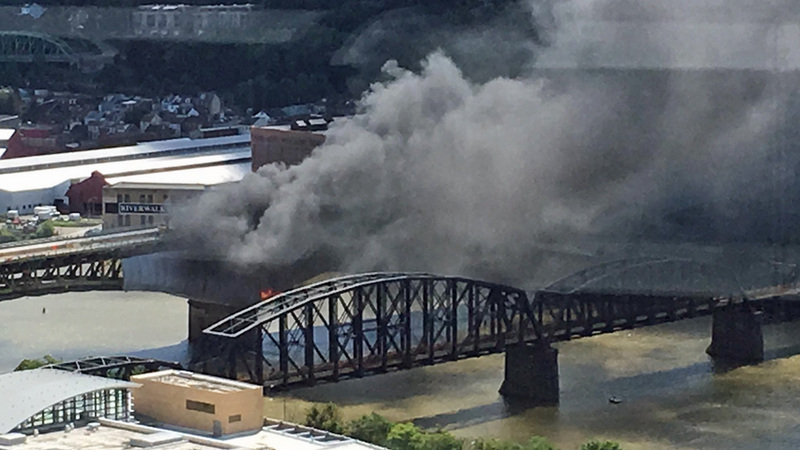 The once partially usable Liberty Bridge caught fire, rendering it completely useless for a period of time. This certified MENSA-level event created a ton of traffic for the entire city of Pittsburgh, but most especially me, thus throwing off my entire robotic, almost simulation-esque routine. I’m a being of efficiency. Instead of adjusting my wake-up time to account for sitting in traffic, I decided to adjust it and my work schedule exactly 1 hour earlier to miss the traffic altogether. I haven’t switched it back since. Little did I know, I had just adjusted my schedule directly into an alternate reality. I now exist inside what appears to be a Nintendo game every single day. This is where everything I’ve just said starts to come together. The first thing I do every morning is get up and take Kylo for a walk. I’m not a morning person and live in a mental fog for an extended period after I wake up. I’m now waking up an entire hour earlier creating a much more dense mental fog. Critical thinking isn’t really in the realm of possibility yet. What I do every morning is such a well-oiled machine and running so efficiently that everything happens at the same time everyday. Even the route I walk with Kylo is the exact same. In my hazy stupor, I experienced a rather delayed scare as a blur which turned out to be the local newspaper, whizzed past my face, slamming into the side of the house next to me, and plopped down on the ground just off to my front left. It took me a while to realize what just took place. I almost got sniped by the Paperboy! Everyone remembers the game, Paperboy. If you owned a Nintendo, you either owned the game or had friends bring it over because that’s how we played video games back in the day. Over the years, newer versions came out for various other Nintendo systems. The thing about Paperboy is that you were playing as the actual Paperboy and on top of delivering papers to all the right houses, you terrorized the neighborhood. You rode around destroying everything thing you possibly could without getting run down, hit by a car or plowing into a skateboarder. For the most part, you’re the aggressor in the game and there’s very little to be concerned about. There’s certainly no chance of being physically harmed in reality. Welp… that day was yesterday morning (2/7/2017). At the same time, in the same place, on the same leg of the walk, in front of the same house, unbeknownst to me, the Paperboy let ‘er rip and connected right in my midsection. I became the embodiment of one of those digital passersby’s in that 8-bit Nintendo neighborhood that gets pelted with the physical form of the daily news. Probably the most pathetic part of this whole ordeal is that physical newspapers are all but extinct, yet I somehow manage to get hit by one via the Paperboy. I can probably shed some light on what the answer to that question might be. In an almost Bill Murray – Groundhog Day fashion, tomorrow morning I will wake up in the same fog, forget everything I have just told you, go on the same walk and pay absolutely no mind to the dangers awaiting me as Kylo and I begin the walk home. Here’s to hoping the Paperboy’s aim yesterday morning was all a big fluke. 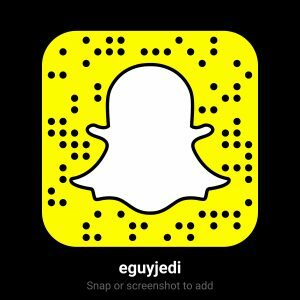 Social is as social does and I do a lot of it, which you can find on facebook, twitter and instagram.